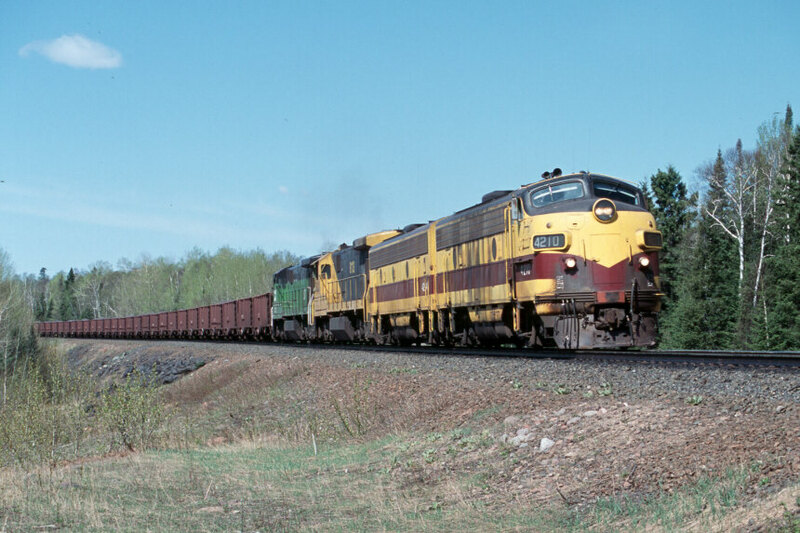 A LTV ABBBA F-9 set pull an empty ore train upgrade out of Taconite Harbor MN on Sept. 1999. 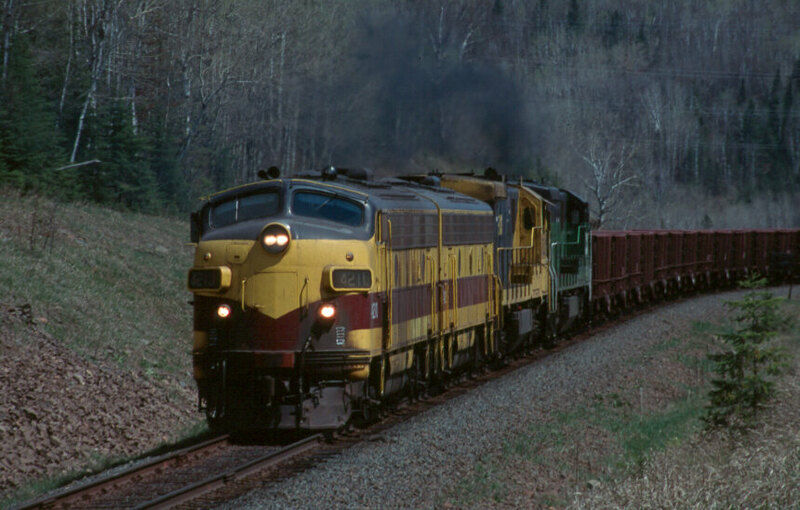 LTV has ran the last of the pellet trains from the Minnesota Iron Range as of July 2001. The sun has set on the last bastion of F-units in regular service. 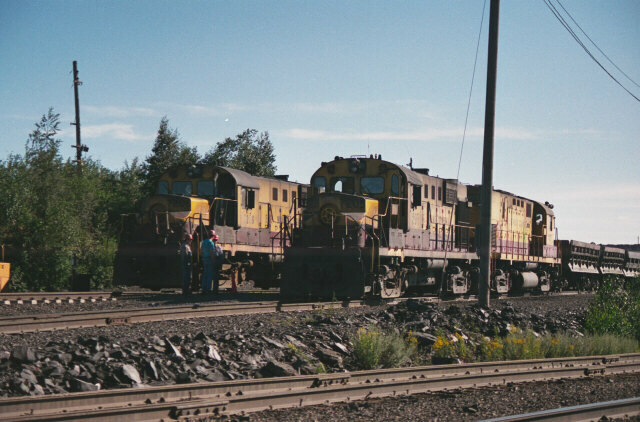 Two shots of the final pellet trains run by LTV. 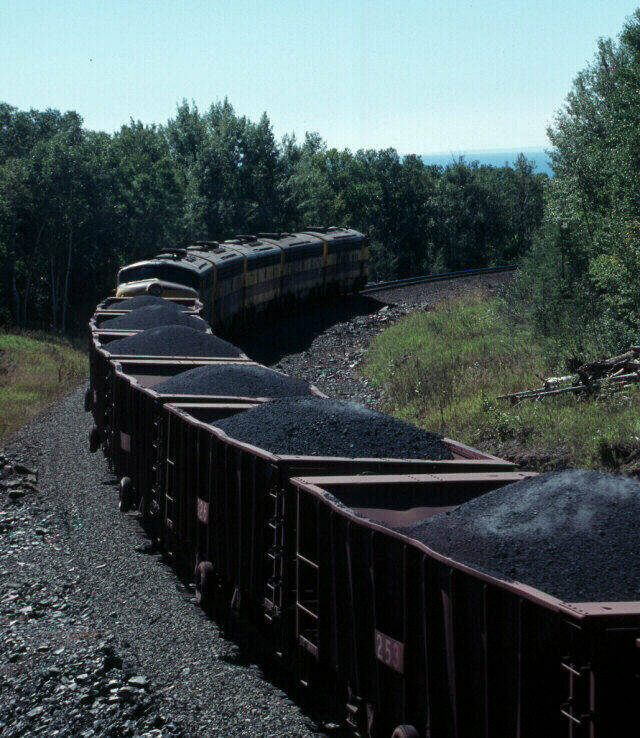 The first shot shows the F-units coming downgrade into Taconite Harbor with a loaded train. 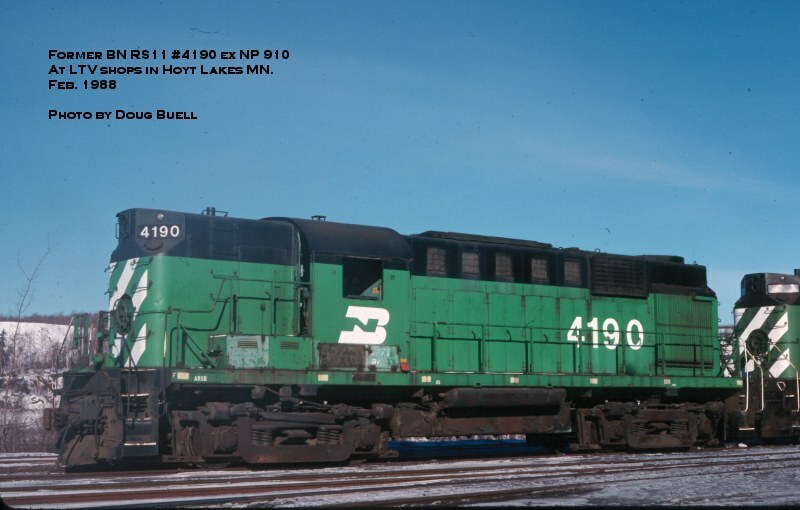 The second shot shows the final train before departure from Hoyt Lakes with a crew member proudly affixing the American flag to the front of the engine. June 2001. Photos by Dave Schauer. F9 #4211 comes out into the light at the east end of Cramer Tunnel downbound with a loaded pellet train. Photo by Dave Schauer. Back in 1988 LTV acquired these former BN RS11's which were rebuilt and given a chopped nose by LTV. 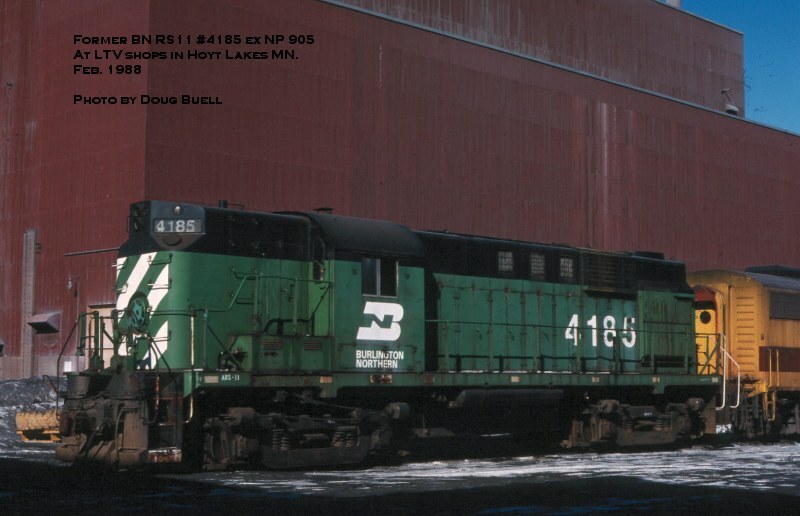 Both Alco's are former Northern Pacific units. Photos by Doug Buell. LTV has put back into service for the time being some of their stored F9's due to the unreliability of some of the leased GE Dash 7's. The first shot to the left is of the loaded 7:00am train down grade at Swanson Rd. with the 4210 and 4224 on the point. 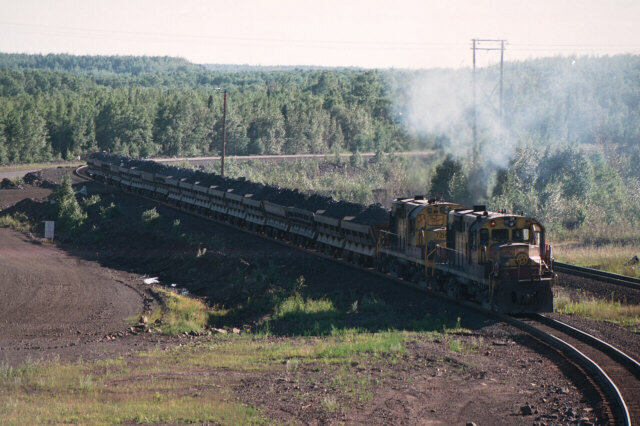 The two middle shots are of the train, now empty pulling upgrade out of Taconite Harbor. The last shot was taken just west of the west portal at Cramer Tunnel. Lets hope this trend will continue. May 2001. 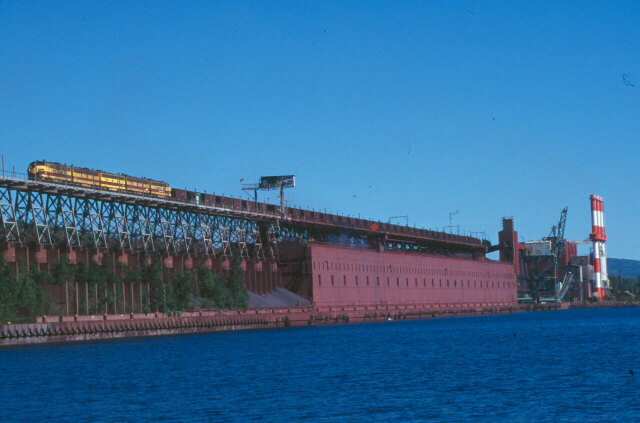 A couple of views of LTV's dock at Taconite Harbor. The first is of the five F9's unloading their train on top on the dock. The second shows a ABBA set of F9's unloading with the Canada Steamship Lines J.W. McGiffin ( now called the Niagara) loading at the dock and an unknown Maritime class straight decker unloading coal for the company power plant. Second photo is from the Basgen collection, courtesy of Dan Mackey. 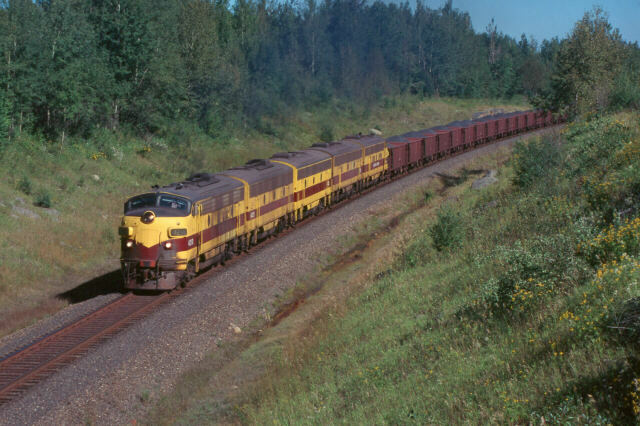 This view at Salem, shows the train as it is about to cross under Stony River Grade Forest Road, which is built on the former DMIR Wales branch north of Northshore Jct. Sept. 1999. 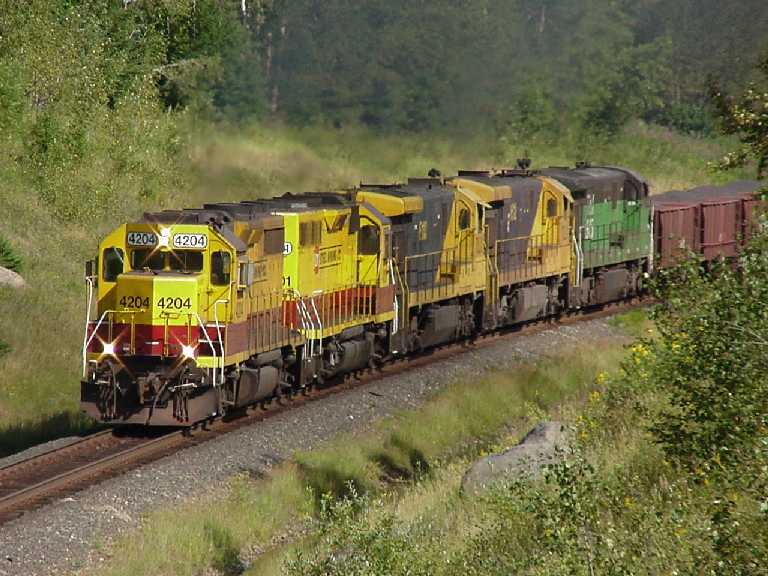 A view of LTV's GP38-3 #4204 leading a sister and three leased GE C30-7's on a loaded train at Salem. Aug. 2000 Photo by Dave Schauer. 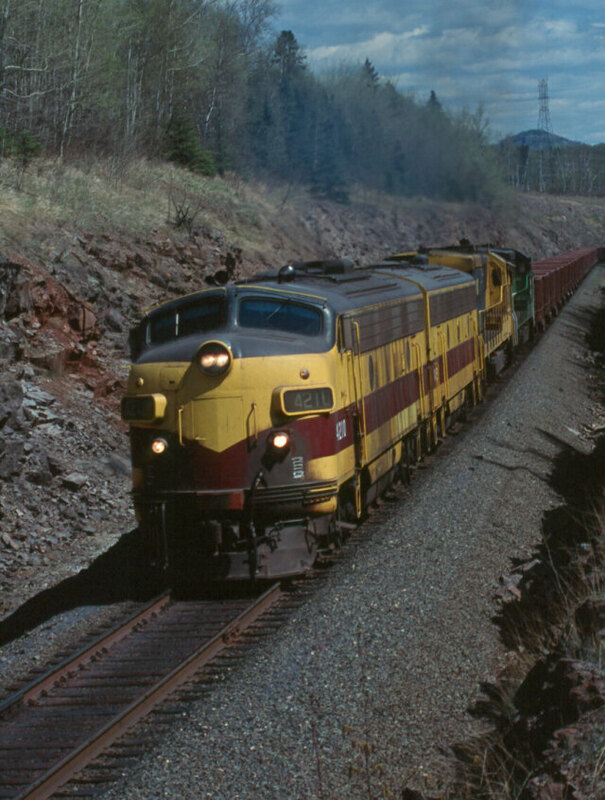 The same train as it is about to enter the west (north) portal of Cramer Tunnel. Sept. 1999. 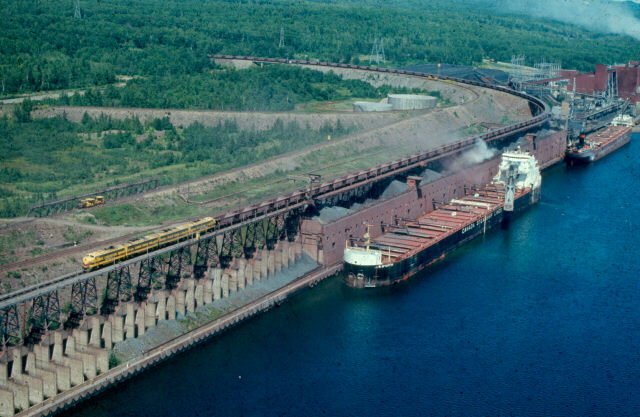 A loaded pellet train descends the 2%+ grade at Zeke towards Lake Superior and the dock at Taconite Harbor. Sept. 1999. 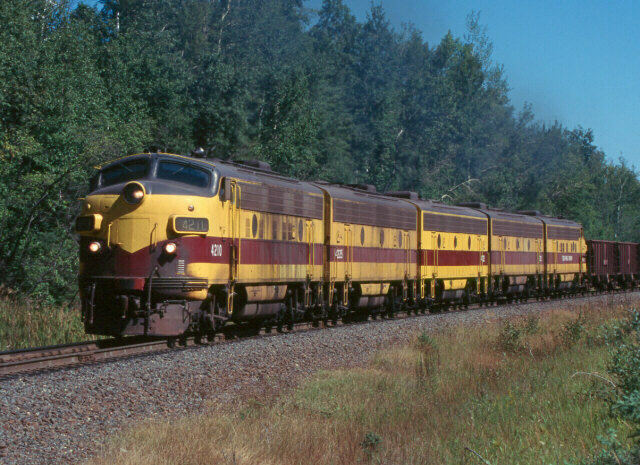 Alco RS11's idle the time away before departing for the crusher plant in 1994. 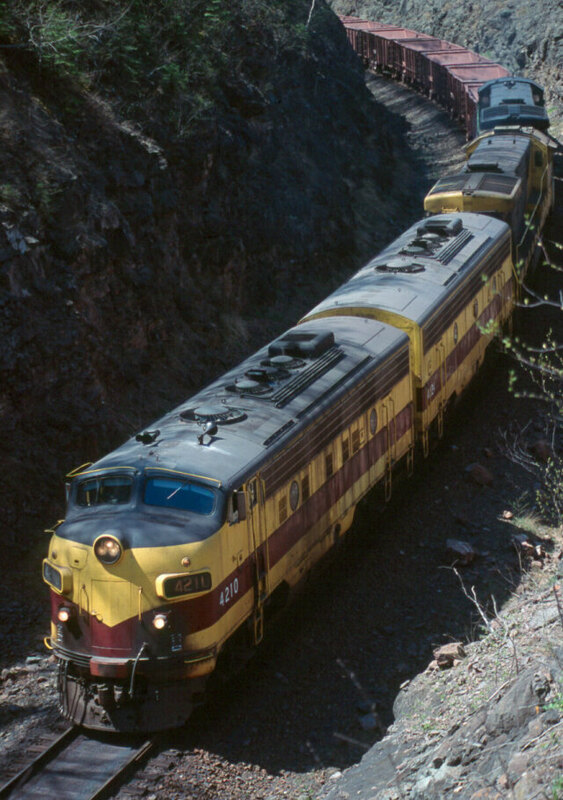 An Alco RS11 leads a LTV's C420 up out of the mine on a crude ore train, 1994. 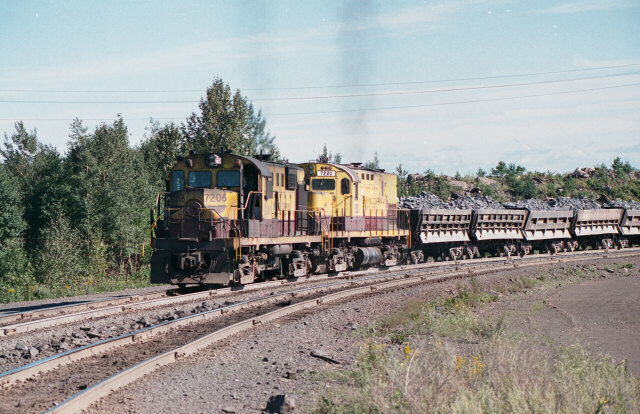 Two Alco RS11's pull a loaded crude ore train up from the mine at Hoyt Lakes, 1994. 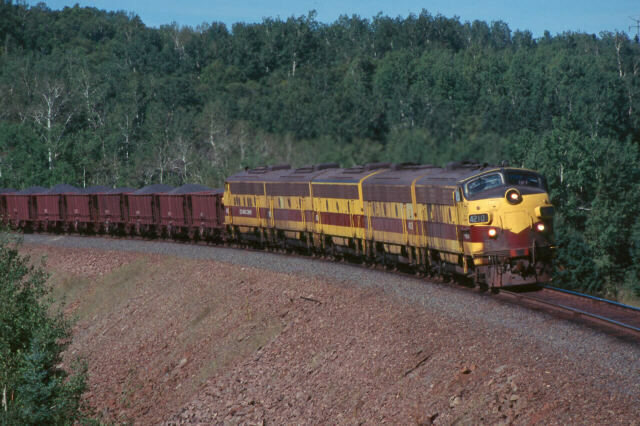 Click PHOTO to see and hear the sounds of a LTV Alco RS11 in operation. Click PHOTO to see and hear the sound of a Baldwin S12 at idle. Thanks to Dan Mackey for the video files.